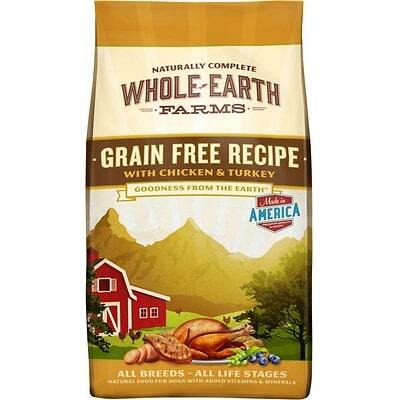 Whole Earth Farms Puppy Recipe is an exceptional quality dog food at a low price. This product has no controversial ingredients and zero artificial preservatives, colors or flavors. However, it has a high amount of carbs, compared to its protein and fat. The quality of the meat and fat in the food is excellent. Whole Earth Farms has a below-average number of dog food recalls and was extremely transparent when answering our questions. Watchdog Labs highly recommends this product. Chicken Meal, Brown Rice, Oatmeal, Pearled Barley, Chicken Fat (preserved with mixed tocopherols), Natural Pork Flavor, Peas, Potato Protein, Chicken, Natural Chicken Flavor, Salmon, Yeast Culture, Organic Dried Alfalfa Meal, Salt, Salmon Oil, Vitamins (Vitamin E Supplement, Vitamin A Acetate, Vitamin B12 Supplement, d-Calcium Panthothenate, Vitamin D3 Supplement, Niacin, Riboflavin Supplement, Biotin, Pyridoxine Hydrochloride, Folic Acid, Thiamin Mononitrate), Minerals (Zinc Sulfate, Iron Amino Acid Complex, Zinc Amino Acid Complex, Manganese Amino Acid Complex, Copper Amino Acid Complex, Potassium Iodide, Cobalt Amino Acid Complex, Sodium Selenite), Dried Blueberries, Choline Chloride, Cinammon, Rosemary, Sage, Thyme, Yucca Schidigera Extract, Dried Lactobacillus Plantarum Fermentation Product, Dried Lactobacillus Casei Fermenation Product, Dried Enterococcus Faecium Fermentation Product, Dried Lactobacillus Acidophilus Fermentation Product. The average dog food we reviewed has 39 total ingredients, with 1 controversial ingredient. 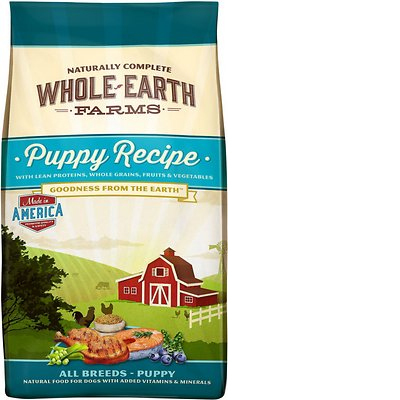 Whole Earth Farms Puppy Recipe has 0 controversial ingredients, that’s excellent. Dog food ingredients are listed in descending order of weight. So when looking at dog food labels, take a close look at the first 5 ingredients. They make up about 80% of the total weight. Barley is a type of grass and a cereal grain. It is a source of calories and several nutrients, including protein, dietary fiber, B vitamins, niacin and various minerals. Barley provides carbs, energy, fiber and other healthy nutrients for dogs. Pearled means that the barley has been ground into finer pieces. Barley is generally a healthy dog food ingredient. As mentioned above, there are zero controversial ingredients in this dog food. This food is made in the United States. That’s good, because the U.S. has strong quality and food safety laws in place for dog food. This uses meats that clearly show the species they come from: Chicken Meal, Chicken, and Salmon. Chicken Fat and Salmon Oil are the added fats, which also clearly label which animal they come from. 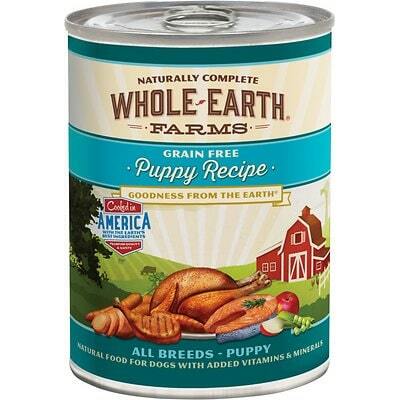 Whole Earth Farms Puppy Recipe contains no controversial preservatives. It’s good to know that ‍not all artificial preservatives are bad. That’s because they serve an important purpose, which is to prevent food from spoiling. However, we consider 11 artificial preservatives controversial because of their potential link to cancer and other serious health conditions. No artificial colors are used in this food, really great. Another area this food excels in is the lack of artificial flavors. They’re unnecessary (dogs like many food flavors) and a potential health concern. 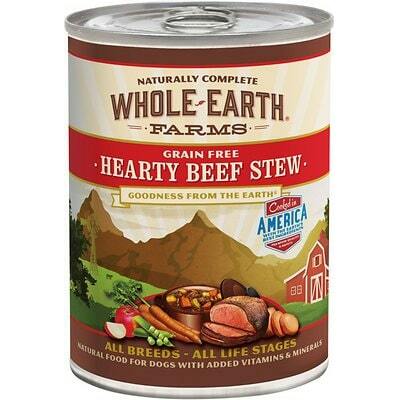 Whole Earth Farms has a below average number of dog food recalls. Whole Earth Farms responded within 1 day with complete answers. Unfortunately, they have an aggressive disclaimer in their email that prohibits us from sharing the answers they provided.